Oscar Winners Anthony Hopkins and Helen Mirren* are spellbinding in this provocative story about the making of one of cinema's most iconic films. Plagued by both a reckless ego and nagging self-doubt, Hollywood legend Alfred Hitchcock (Hopkins) becomes obsessed with a grisly murder story that the studios won't back. Determined, he risks his reputation, his home and even the love of his wife Alma (Mirren), as he sets out to make the film. Ultimately, Hitch wins Alma over, and the two collaborate to create an enduring masterpiece - Psycho. 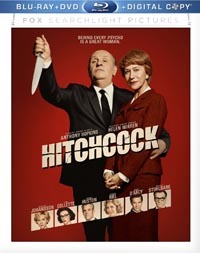 Also starring Scarlett Johansson, Toni Collette and Jessica Biel, Hitchcock is "a knockout from start to finish" (Rex Reed, New York Observer).